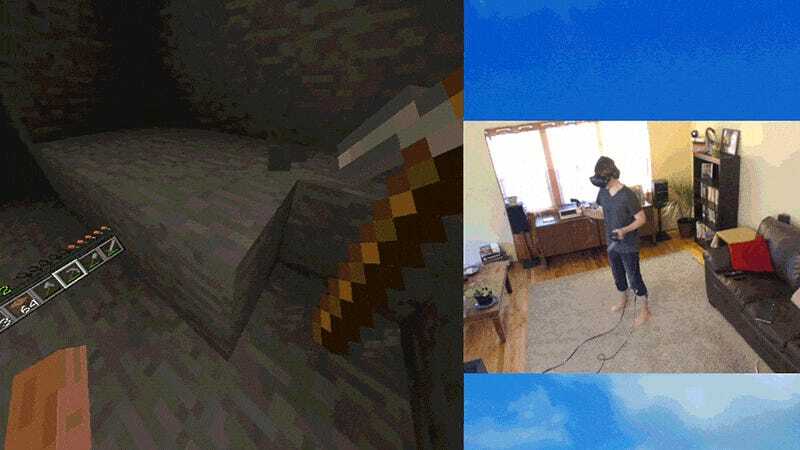 Like chocolate and peanut butter, Minecraft and virtual reality go together about as well as two things can. This is easily one of the best things I’ve done in VR. I’m playing a version of Minecrift that’s been designed to work with the HTC Vive. To play it, you’ll need a Vive and a copy of the game itself. I followed these installation instructions and it worked without a hitch. The Vive version of Minecraft is much like the regular game, albeit slower in most respects. Your right hand holds your tool or weapon while your left hand holds your inventory and crafting interface somewhat like a digital painter’s palette as seen in Google’s Tilt Brush VR painting app. (In the video I say “easel” instead of “palette.” Sorry, painters.) You move things around in storage or in your inventory by using your right hand as a pointer, which feels very natural. Allocating crafting resources takes a bit more finagling than it does using a mouse and keyboard, but I’ve gotten used to it pretty quickly. You move around by teleporting, rather than walking, which is a common approach for VR games. It seems like it might be weird, but it actually doesn’t bother me at all. There’s an option to walk forward like normal, but I don’t really use it. It doesn’t make me nauseous, but it feels awkward and unnatural compared with the teleportation options. The current VR version of Minecraft is pretty polished, but it does still feel like a work in progress. I’m guessing there will be more customizable controls and some general performance and interface improvements in the future. All the same, this is one of the most immersive and impressive things you can do in VR. If you have a Vive, check it out.